On behalf of Heritage for Peace, we would like to wish you all joy over the festive period and peace and happiness in the New Year. Insightonconflict.org on January 8 2016 examines the role of cultural heritage in peace building here, referencing the work of Heritage for Peace. 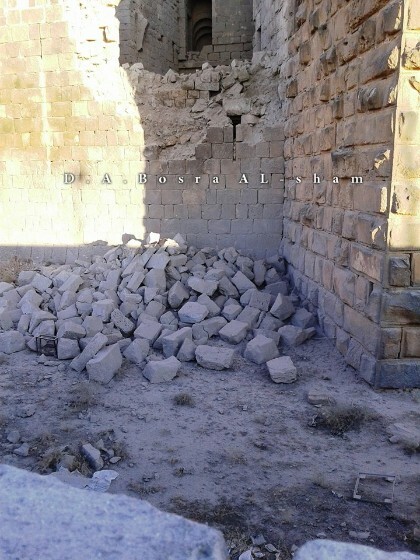 Images from Bosra Sham Antiquities Department show the damage to Bosra Roman Citadel in Bosra World Heritage site as a result of airstrikes, released 22 December 2015, available here. See also the report from The Telegraph on December 24 2015 here. Related to this, the report on damage to the Roman theatre from the DGAM on December 23 2015 is available here. The DGAM stated on December 23 2015 that its sources in Idlib report that vandalism and looting is continuing in the countryside in the Ancient Villages of Northern Syria UNESCO World Heritage Site. See more information and many photographs here. The Director-General of the DGAM, Maamoun Abdulkarim, in the Irish Times, said that a mortar struck the garden of the National Museum, Damascus, on December 13th. The garden is still open to visitors, although the museum itself is closed and all items removed to safe storage. See the December 27 article here. Protect Syrian Archaeology published images of the Arch of Triumph in Palmyra after the destruction by Daesh (ISIS), on December 9 2016 here. Jordan has captured 200 stolen Syrian artifacts since March 2011, according to Alghad Newspaper interview with the Jordanian director-general of antiquities on December 30 2015. See it here. Based on an interview with a recently-arrested member of Daesh, Albawaba.com on December 23 2015 suggests that the organisation is using stores in Lebanon (such as a butcher shop) as ‘fronts’ to move looted items from Syria. See more information here. In a well written and well-researched article, on January 9 2016 the New York Times argues that “weak and inconsistent” laws make it easy for Daesh to loot, and that smuggling routes through Bulgaria (evidenced by seizures of Iraqi material) are likely, in an article by Steven Lee Myers and Nicholas Kulish here. 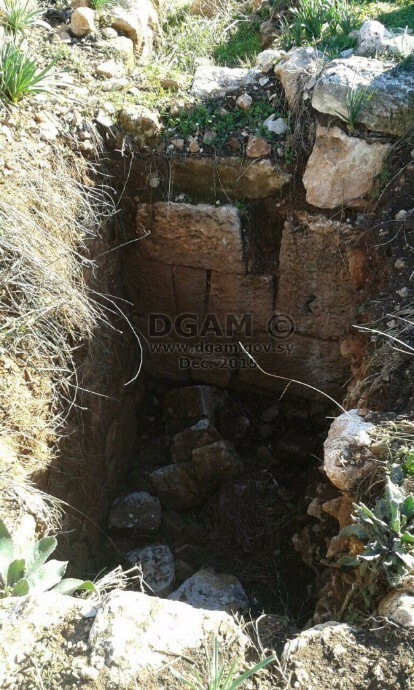 Is Media Coverage Encouraging Archaeological Looting in Syria? Extremely interesting analysis by The Gates of Nineveh blog,December 28 2015, considering the role of the international media in driving antiquities looting in Iraq and Syria here. The DGAM recently engaged the services of French specialists to train a number of its staff in digital documentation techniques, it reported on December 22 2015 here. Exiled Syrian artists at the Za’atari Refugee Camp in Jordan are making models of imperiled Syrian heritage sites, reports the UNHCR on January 5 2016. See the article here. The Association for Research into Crimes against Art (ARCA) has extended the deadline for its Minerva Scholarship for its postgraduate certificate in the study of art crime/cultural heritage protection, specifically to facilitate applications from students from Iraq, Libya, Syria, and Yemen. More information can be found here and here. Cultural heritage lawyer Rick St. Hilaire on December 29 2015 calls for greater scrutiny by US customs in light of statistics that show that Syrian antiquities are still being imported to the United States, even while imports of other goods from Syria dropped dramatically. See full details here. The International Council of Museums (ICOM) has produced an open access digital book entitled “Countering Illicit Traffic in Cultural Goods: The Global Challenge of Protecting the World’s Heritage” See here. Partly as a result of the UK government’s decision to sign the 1954 Hague Convention, the British Army plans to recruit heritage specialists to its new 77 Brigade to assist in war zones, reports The Telegraph on December 25 2015 here. The Pipeline named Khaled al-Assad as archaeologist of the year on December 31 2015. See here. In his Christmas address, The Pope denounced crimes against cultural heritage, particularly those attributed to Daesh in Syria and Iraq. See coverage from Al Arabiya here. France is intensifying its role as a global leader in the fight to curb the trafficking of illegal antiquities, reports the Art Newspaper on January 4 2016 here, building on their release of their 50 point recommendation report (see previous newsletters). The BBC reports on December 28 2015 that a facsimile of the arch leading into the now-destroyed Temple of Bel at Palmyra will be installed in Trafalgar Square by the Institute of Digital Archaeology in time for World Heritage Week in April 2016. A facsimile will also placed in Times Square in New York. See the full article here. For a picture of how it will look, see here. TV5 examines how to curb the trafficking of antiquities in a video (12’55”) on December 27 2015 here. On December 26 2015 the Creatorsproject looks back at art crimes in 2015 here.